Chelsea boss Jose Mourinho says there is a chance captain John Terry will be fit to face Tottenham on Sunday. 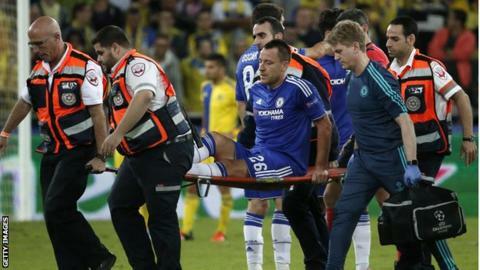 The 34-year-old defender injured an ankle during Tuesday's 4-0 Champions League win at Maccabi Tel Aviv. Mourinho had initially ruled him out of the game at White Hart lane but said on Friday: "Today he didn't train, but we have a little hope that it's possible. "I don't want to say that it's impossible that he plays, because maybe he plays and you'll say I was hiding." The Blues go into Sunday's game 10 points and 10 places behind their London rivals in the Premier League. Spurs have a quick turn around for the 12:00 GMT kick-off, having endured a 2,500-mile return from Thursday night's 1-0 Europa League away win over Qarabag in Azerbaijan. But Mourinho has shown little sympathy for Tottenham and recalled a hectic spell in April 2014, when his side played three key fixtures in nine days: facing Atletico Madrid in a two-legged Champions League semi-final either side of a league game against Liverpool. "Our country decided that it was not a problem for us to play Saturday or Sunday, so we played Sunday, before the second leg of the Champions League, which is the biggest competition in the world," said Mourinho. "If this country in that moment decided it was not a problem for Chelsea, why is it a problem now for Tottenham? "It was not a problem for us. It's not a problem for Tottenham."